The medical education environment is rapidly changing. Competency-based medical education (CBME) is a great advance, but operationalizing competencies for teaching and assessment is problematic. Entrustable professional activities (EPAs) can revitalize CBME by connecting competencies to practice, creating flexibility in programs. CBME requires and deepens the nature of workplace-based assessments. It is important to use EPAs to verify residents' ability to care for critically ill patients unsupervised in simulation education. Competency-based medical education (CBME) is a 21st-century revolution in medical education that has become a mainstream means of training modern physicians. It is composed of six core competencies established by the Accreditation Council for Graduate Medical Education (ACGME). The key concept of CBME is to design courses based on the core abilities required by trainees and to emphasize the results of training, rather than assessment of the training process. It is an outcome-based approach for the design, implementation, assessment, and evaluation of a medical education program using an organizing framework of competencies ,. The currently promoted CBME overemphasizes the concept that the medical profession is composed of many professional competency fragments. At present, higher level medical expertise cannot be demonstrated and evaluated using CBME. The concept of entrustable professional activities (EPAs) was first proposed by Ten Cate. EPAs can be defined as professional responsibilities that can be fully entrusted to a trainee ,. Clarifying the relationship between two important concepts – competencies and EPAs – is important. EPAs are not an alternative to competencies but a means to translate competencies into clinical practice. EPAs usually facilitate a holistic and integrated assessment of clinical tasks. Achieving an EPA often requires multiple core competencies. The difficulty, risk, or complexity of EPAs can be increased based on the ability of trainees. Therefore, medical educators can apply a series of EPAs and supervise the competency level that trainees need to achieve. EPAs can be executed, and the process and results can be observed separately or simultaneously depending on the competency level of trainees. Determining whether the trainee possesses the “trusted” core ability is appropriate. The concept of EPAs has been gradually implemented in different areas of medical professional education, such as family medicine and pharmacology. The Association of American Medical Colleges has also developed 13 core EPAs that medical students should be able to perform on entering residency. A review of the literature has clearly shown that abundant information on EPAs in clinical teaching is available. Kman et al. proposed an EPA test for clerkship through simulation of a diagnosis of a myocardial infarction with ST-segment elevation with cardiac arrest. Approximately 86% of students reached the judgment of entrustment at the end of the test. Students rated the experience as valuable and thought that it would change their performance in a clinical setting. Thompson et al. developed a critical case scenario assessment instrument through high-fidelity simulations to evaluate medical students' performance in executing critical actions related to EPA-13 competencies. In their study, 87% of participants were rated as having reached entrustment to manage the care of an emergency patient. In these two studies, a team comprising at least four students jointly managed a case scenario. However, only the team leader was evaluated using the assessment instruments. Critical actions included assigning triage skills, mustering the medical team, identifying causes of patient illness, and initiating management. Identifying backup solutions is an essential trait for medical students. The high-fidelity simulation showed favorable potential for the effective assessment of medical students' ability to manage an urgent or emergency patient. Conventional health-care education involves didactic instruction using lectures and clinical learning through the apprenticeship method. However, a systematic and integrated teaching approach is lacking. Experiential learning represents an advance in health-care education; it is defined as learning from clinical practice exercises when caring for patients. However, this is difficult in the modern medical environment because of safety and privacy concerns. Inexperienced doctors may not appropriately manage critical medical emergencies, which may be harmful to patients, resulting in training physicians experiencing psychological stress and feeling burdened. Medical simulation training is one of the most important innovative teaching models in medical education of recent years. It can provide a training environment that does not affect patient safety and privacy and can tolerate erroneous judgments and incorrect technical operations. A simulation can be repeated to show a general or rare complex critical situation; it can also be applied in an almost realistic environment. The simulation can be suspended at any time for an ad hoc discussion or repeat demonstration. After the simulation is completed, participants can provide feedback on the training process and review cooperation among peers; this can increase learning among participants. The current fellowship training program in pulmonary and critical care medicine already integrates EPAs and curricular milestones. After receiving training, fellowship graduates are expected to be able to perform unsupervised. These EPAs and curricular milestones have been decided by a multidisciplinary committee of medical educators representing the American College of Chest Physicians, American Thoracic Society, Society of Critical Care Medicine, and Association of Pulmonary and Critical Care Medicine Program Directors. Moreover, it has been suggested that bronchoscopy training programs should incorporate multiple tools, including simulation, and that certifying agencies should transition from a volume-based certification system to skill acquisition and knowledge-based competency assessment for trainees. According to the performance of individuals, we can provide different levels of assessment consistent with EPAs to vary degrees of training and achieve different levels of assessment. A sufficient competency training program for patient care includes counseling, discharging patients, leading family meetings, designing treatment plans, and resuscitating patients. To take care of critically ill patients in intensive care units, it is important to maintain and improve their vital signs and hemodynamic status, including monitoring and treatment of cardiopulmonary function, to understand the pathophysiology of major stress, such as shock or trauma, to correct imbalances in nutrition, electrolytes, coagulation, and metabolism, to form a differential diagnosis, to give appropriate therapy, and to consult other specialists properly to work together to treat patients. EPAs are the focus of assessment by observation, ratings, or other means. The overall assessment of competencies is not actually done; instead, it is inferred from the assessment of sufficient EPAs. Reaching this level takes fixed standards and flexible time. To design EPAs, a practitioner is usually required to integrate multiple competencies from several domains, such as content expertise and skills in collaboration, communication, and management. Designing a high-fidelity simulation for a critical medical condition, coupled with actual operational procedures, enhances the clinical skills of team members and strengthens teamwork cooperation and communication skills. Simulations must be consistent with the skill level and cognitive ability of the trainees to facilitate their learning in a safe environment; before scenario simulation, teachers should engage in planning, developing achievement goals, implementing methods, consensus building, summarizing, and giving key tips. Balancing thoughtful challenges for learners and adequate supervision is necessary. The instructor can directly assess the abilities of team members, including their medical knowledge, communication skills, professionalism, clinical judgment, treatment, operational procedures, and teamwork. Simulation is a comprehensive teaching strategy that can be performed through real clinical practice exercises. A plan or goal should be established when using the simulation to teach trainees. For example, after assessing the needs of students, the theme of the case scenario should be carefully selected and implemented, and the cost-effectiveness of training should be measured with the subject group of teachers. EPAs can serve as a roadmap and destination for trainees, program directors, and educators. 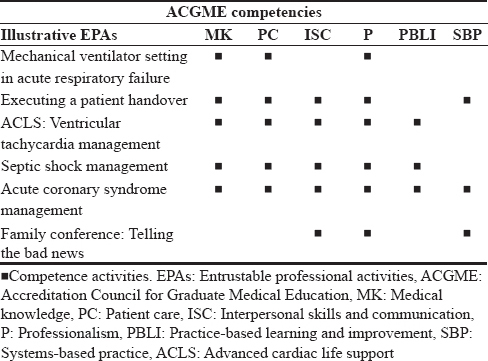 Together with reporting milestones, EPAs can indicate trainees' progress in the mastery of the six ACGME core competencies of graduate medical education [Table 1] ,. Much of the work in health care entails tasks or responsibilities that must be entrusted to individuals. Research has demonstrated that ability, integrity, and reliability must be fulfilled for someone to trust another person and be willing to be vulnerable to the risks associated with doing so. An entrusted trainee must demonstrate the necessary competence to execute EPAs unsupervised. Ten Cate proposed a five-level rating scale. At Level 1, the trainee is ready to be present and observe; at Level 3, the trainee is ready to act under indirect supervision; and at Level 5, the trainee is ready to provide supervision to junior learners. Each of the five levels has direct consequences for the trainee and for patient care. During the training program, multiple EPAs are designed to mimic critical conditions such as septic shock, acute respiratory failure, and acute coronary syndrome [Table 2] ,,. EPAs even mimic advanced cardiovascular life support to verify residents' ability to care for patients with other team members. Finally, at the end of the training program, all residents are expected to be able to independently care for critical medical patients unsupervised. The medical environment is changing rapidly and medical disputes are increasing. Most patients have a sense of hostility toward inexperienced physicians. The trial-and-error approach cannot be used to teach trainees how to manage critical illness because of safety concerns. Simulation can provide learning opportunities and facilitate repeat demonstration of similar scenarios in the absence of stress in the environment. It is important to use EPAs to verify residents' ability to care for critically ill patients unsupervised in a simulation scenario. Simulation scenarios should be integrated to connect competencies to enhance critical care education. CBME is a great advance, but operationalizing competencies for teaching and assessment is problematic. EPAs can revitalize CBME by connecting competencies to practice and can create flexibility in programs required by CBME, ensuring the comprehensiveness of workplace-based assessments. This study was supported by the Tzu Chi Medical Mission Project 105-12, Buddhist Tzu Chi Medical Foundation. Swing SR; International CBME Collaborators. 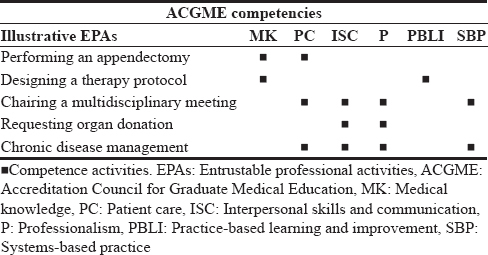 Perspectives on competency-based medical education from the learning sciences. Med Teach 2010;32:663-8. Smith SR, Dollase RH, Boss JA. Assessing students' performances in a competency-based curriculum. Acad Med 2003;78:97-107. Frank JR, Mungroo R, Ahmad Y, Wang M, De Rossi S, Horsley T,et al. Toward a definition of competency-based education in medicine: A systematic review of published definitions. Med Teach 2010;32:631-7. Frank JR, Snell L, Englander R, Holmboe ES; ICBME Collaborators. Implementing competency-based medical education: Moving forward. Med Teach 2017;39:568-73. Talbot M. Monkey see, monkey do: A critique of the competency model in graduate medical education. Med Educ 2004;38:587-92. Glass JM. Competency based training is a framework for incompetence. BMJ 2014;348:g2909. ten Cate O. Entrustability of professional activities and competency-based training. Med Educ 2005;39:1176-7.
ten Cate O. Trust, competence, and the supervisor's role in postgraduate training. BMJ 2006;333:748-51. Choe JH, Knight CL, Stiling R, Corning K, Lock K, Steinberg KP,et al. Shortening the miles to the milestones: Connecting EPA-based evaluations to ACGME milestone reports for internal medicine residency programs. Acad Med 2016;91:943-50. Shaughnessy AF, Sparks J, Cohen-Osher M, Goodell KH, Sawin GL, Gravel J Jr.,et al. Entrustable professional activities in family medicine. J Grad Med Educ 2013;5:112-8. Pittenger AL, Chapman SA, Frail CK, Moon JY, Undeberg MR, Orzoff JH,et al. Entrustable professional activities for pharmacy practice. Am J Pharm Educ 2016;80:57. Winn AS, Marcus CH, Sectish TC, Williams KA, Smith GC, Gorbounova I, et al. Association of American Medical Colleges core entrustable professional activities for entering residency: Resident and attending physician perceived supervisory needs of new interns. Acad Med 2016;91:S13. Kman NE, Thompson L, Hess J, Dora-Laskey A, Sule H, Moadel T, et al. Entrustable professional activity 10: Case simulation and assessment – STEMI with cardiac arrest. MedEdPORTAL Publ 2016;12:10517. Thompson LR, Leung CG, Green B, Lipps J, Schaffernocker T, Ledford C,et al. Development of an assessment for entrustable professional activity (EPA) 10: Emergent patient management. West J Emerg Med 2017;18:35-42. O'Brien BC, Bachhuber MR, Teherani A, Iker TM, Batt J, O'Sullivan PS,et al. Systems-oriented workplace learning experiences for early learners: Three models. Acad Med 2017;92:684-93. Wu WT, Wu YL, Hou SM, Kang CM, Huang CH, Huang YJ,et al. Examining the effects of an interprofessional crew resource management training intervention on perceptions of patient safety. J Interprof Care 2016;30:536-8. Brunette V, Thibodeau-Jarry N. Simulation as a tool to ensure competency and quality of care in the cardiac critical care unit. Can J Cardiol 2017;33:119-27. Gordon JA, Oriol NE, Cooper JB. Bringing good teaching cases “to life”: A simulator-based medical education service. Acad Med 2004;79:23-7. Fessler HE, Addrizzo-Harris D, Beck JM, Buckley JD, Pastores SM, Piquette CA,et al. Entrustable professional activities and curricular milestones for fellowship training in pulmonary and critical care medicine: Report of a multisociety working group. Chest 2014;146:813-34. Ernst A, Wahidi MM, Read CA, Buckley JD, Addrizzo-Harris DJ, Shah PL,et al. Adult bronchoscopy training: Current state and suggestions for the future: CHEST expert panel report. Chest 2015;148:321-32.
ten Cate O, Scheele F. Competency-based postgraduate training: Can we bridge the gap between theory and clinical practice? Acad Med 2007;82:542-7. Harris P, Bhanji F, Topps M, Ross S, Lieberman S, Frank JR,et al. Evolving concepts of assessment in a competency-based world. Med Teach 2017;39:603-8. Harris P, Snell L, Talbot M, Harden RM. Competency-based medical education: Implications for undergraduate programs. Med Teach 2010;32:646-50. Lockyer J, Carraccio C, Chan MK, Hart D, Smee S, Touchie C,et al. Core principles of assessment in competency-based medical education. Med Teach 2017;39:609-16. Nousiainen MT, McQueen SA, Ferguson P, Alman B, Kraemer W, Safir O,et al. Simulation for teaching orthopaedic residents in a competency-based curriculum: Do the benefits justify the increased costs? Clin Orthop Relat Res 2016;474:935-44. Butler-O'Hara M, Marasco M, Dadiz R. Simulation to standardize patient care and maintain procedural competency. Neonatal Netw 2015;34:18-30. Englert NC, McDermott D. Back to fundamentals: Using high- and low-fidelity simulation to provide reinforcement of preventative measures for sepsis. Crit Care Nurs Q 2016;39:14-23. Caverzagie KJ, Cooney TG, Hemmer PA, Berkowitz L. The development of entrustable professional activities for internal medicine residency training: A report from the Education Redesign Committee of the Alliance for Academic Internal Medicine. Acad Med 2015;90:479-84. Ten Cate O. Competency-based education, entrustable professional activities, and the power of language. J Grad Med Educ 2013;5:6-7. Ten Cate O. Entrustment decisions: Bringing the patient into the assessment equation. Acad Med 2017;92:736-8. Tully K, Keller J, Blatt B, Greenberg L. Observing and giving feedback to novice PGY-1s. South Med J 2016;109:320-5.
van Loon KA, Driessen EW, Teunissen PW, Scheele F. Experiences with EPAs, potential benefits and pitfalls. Med Teach 2014;36:698-702.